The Columbia River Gorge was my childhood playground, and it continues to be a place I visit year round. It is where I first topped out on a trail and discovered a love of big vistas. It’s also where I was first stung by a bee. I remember my parents getting lost trying to find the trailhead to Table Mountain, and finding the trailhead remains as much of a challenge for the uninitiated today as it was when we first tried so many years ago. As a kid I had multiple encounters with deer along the steep slopes of the trail to Devils Rest, an experience I haven’t had in the Gorge in much too long. The Gorge was and still is a wonderland, a place of imagination, new challenges, and a chance to get to know the wild at our doorstep. At the top of Angels Rest, one of my family’s favorite day hikes when I was young, the road and railroad far below feel like something foreign, almost unnoticeable. But listen closely and you’ll hear the roar of a semitrailer truck or the screeching of a train’s metal wheels as it makes its way through the narrow river corridor. Almost unnoticeable is pretty good for a nature escape so close to one of the West Coast’s most important ports, but this could all be about to change. Currently around two oil trains make their way through the Columbia River Gorge every day on their way from the Rockies to the Pacific Ocean. But if the Pacific Northwest is going to be used for major oil shipping infrastructure, utilizing the Columbia River is a necessity. 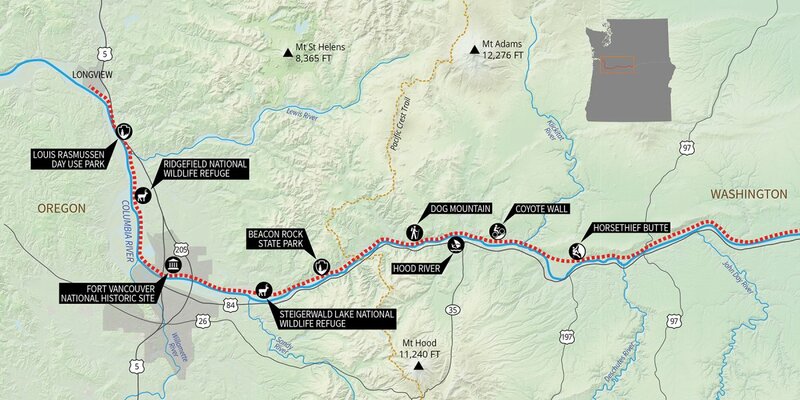 The Columbia River channels it’s way through the Cascade Range, mountains that otherwise present a challenging natural obstruction for routes through the West’s grandest peaks. The river is the life support for the Pacific Northwest today, much as it has been for people living here for the past 10,000 years. Lewis and Clark followed the river on their Journey of Discovery, as did John Jacob Astor’s overland party and the massive influx of settlers following the Oregon Trail. The annual celebration of the salmon run on the Columbia River was centered at the now-flooded Celilo Falls. A river once relied on for its widely available nutritional food source is now known for its ability to generate massive amounts of energy in the form of hydropower. And now it finds itself connected to fossil fuels as well. 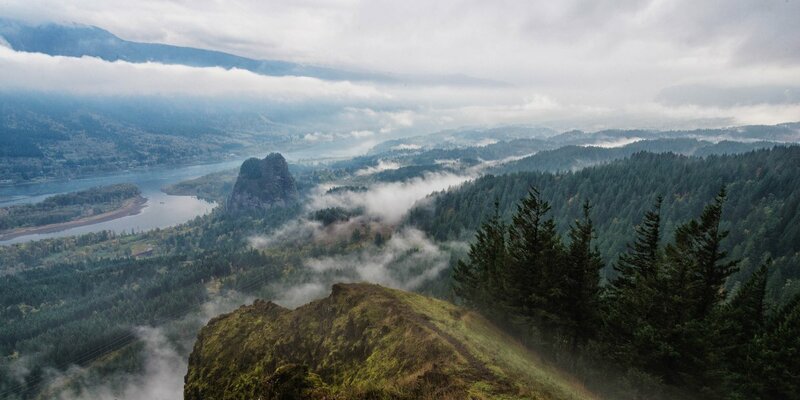 An impressive view of the Columbia River Gorge looking west from Little Hamilton Mountain. Photo by Matthew King. Since the early 2000s energy companies have successfully increased tar sands output from Canada and the Dakotas using existing pipelines and rail routes to reach major ports for refining and shipping fuel abroad. Building the Keystone XL Pipeline was just one fuel transport option, and the easiest one available, for getting to market much of the 2.3 million barrels of oil per day extracted from Alberta’s tar sands and the expanded output from North Dakota’s Bakken Shale. But with the Keystone construction blocked, the search is on for other routes. Refining and shipping facilities already exist along the West Coast’s seaboard, from California to British Columbia. With no Keystone, oil trains are the next best answer, and efforts to increase the refining and shipping capacity of these ports are ramping up significantly. The prospect of an oil-by-rail pipeline comes with numerous plans to beef up and build new export facilities along Washington’s coast. For the Columbia River Gorge, a big increase in oil train traffic comes with an even greater risk of environmental and recreational disruption. We have a role to play in sharing why we love these places and want to keep the risks at bay. This article follows an oil train on its path down the Gorge, and it explores the impacts these trains will have on all of us and the risks they will pose to our hopes of keeping the Gorge, at a minimum, in as wonderful a state as it is today. By their names alone, Horsethief Butte and nearby Coyote Wall conjure the intersection of civilization and wild spaces that characterized the Columbia River Gorge not too long ago. Today Horsethief is popular among rock climbers. With multiple easy top-rope routes, it’s a great place for novice climbers to try trad climbing on real rock. Coyote Wall, with its gentle slopes and big vistas, is used by mountain bikers (who call it Syncline), trail runners, and hikers. Across the river sits The Dalles Dam near the now submerged Celilo Falls. And at Horsethief and nearby Columbia Hills State Park, the petroglyphs provide evidence of the longstanding historical importance of the area. Before European colonization, Celilo Falls served as a central hub for the native tribes that once freely populated the Pacific Northwest and relied on migrating salmon as their protein source. In 1957, with the approval of The Dalles Dam, the Bureau of Reclamation decided the energy producing capacity of the Columbia River outweighed the cultural implications of a permanently flooded Celilo Falls. The Dalles Dam raised the river over 40 feet in front of Horsethief Butte and Coyote Wall, providing an easy route for highways and rail lines along the river’s controlled banks. The sight and sound of freight trains is already common in the area, and it would become almost incessant if the oil processing and coal shipping terminals currently proposed are added. Four oil and coal trains daily would increase to 57 trains, each carrying fossil fuels to market and thereby increasing pollution emissions and the chances for a dangerous spill. These trains would close street crossings in the towns on the Washington side of the Gorge for hours of each day, and they would be a constant visual reminder to all of us that the Columbia River is considered by some a power plant and industrial corridor first and foremost. Trains pass the towns of Hood River, Oregon, and White Salmon, Washington a few miles downriver from Coyote Wall. These towns are named for rivers that flow from Mount Hood and Mount Adams, respectively, and drain into the Columbia River. The area has become a mecca of sorts for outdoor enthusiasts, with world-class windsurfing and kiteboarding, whitewater rafting, and a year-round adventure culture. On a trip from the The Dalles to Hood River you will likely see someone kiting or windsurfing in the river on any given day, especially in summer. Rolling an increasing number of volatile, accident-prone trains through this area is a scary proposition. A study by Sightline Institute, the leading advocacy group focusing on oil trains in the Pacific Northwest, counted 100 freight train derailments in 2013 alone, a number widely consistent with data from prior years. Derailments cause spills, and in the case of oil trains, explosions, with long-term consequences for a region. Derailments are riskiest in areas where humans congregate. Given the intensity of an oil train explosion, it can take up to 36 hours to reach the burning cars. Anyone nearby would be on their own attempting to escape the effects of the explosion. The potential for human loss is huge and terrifying, as a 2013 oil train derailment and resulting explosion in Lac-Mégantic, Quebec, demonstrated all too well. The catastrophe killed 47 people and effectively wiped a town off the map. Not far past White Salmon the trains pass a very popular trailhead at Dog Mountain. On nice spring and summer days, especially once the marvelous display of wildflowers are in full bloom, the trailhead lot fills up and cars park along the highway. 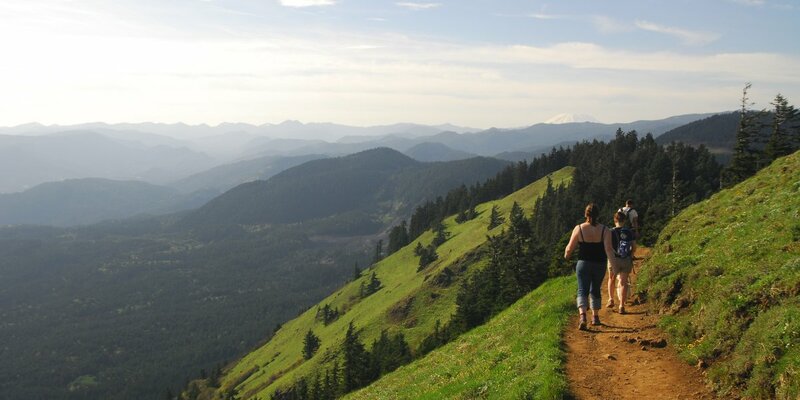 One of the Gorge's longer and steeper hikes with great summit views, Dog Mountain is a beloved hike for many Portland and Vancouver residents. Hiking down from the summit of Dog Mountain. Photo by Tyson Gillard. Just 29 years after the construction of The Dalles Dam and the flooding of Celilo Falls, outdoorspeople concerned that logging would remove the last vestiges of grandeur from the vaulted cliffs of the Columbia River Gorge rejoiced when an 80-mile stretch of the river and surrounding areas encompassing 292,500 acres were protected as a National Scenic Area. It remains the largest of the National Scenic Areas, a rarely-used designation meant to combine land production and privatization with broader public protections. The duality of the Columbia River remains to this day. Dams along its stretches have an installed capacity greater than 5,000 megawatts of power, fish hatcheries attempt to replace the native salmon runs impacted by churning turbines and dammed river tributaries, and trailheads depart from the river and take an increasing number of hikers into the woods to experience the majesty of a true natural wonder just a short drive from Portland. Continuing west from Dog Mountain, the river bends and runs in a relatively straight line to the southwest toward Portland and passes by Beacon Rock, the iconic monolith of the Gorge. If you were born after 1975, chances are you played The Oregon Trail, a beloved video game that introduced school kids across the U.S. to the great migration west. Just like the real Oregon Trail, there were two routes to take when you reached the Cascade Mountains, were you lucky enough to reach it without dying from dysentery. The more perilous route over Mount Hood went via Barlow Road. The more common route went down the Columbia River. Covered wagons were put onto rafts at The Dalles, and players had to navigate the river's hazards to reach Beacon Rock. If you crashed in the river, that was it, you lost the game. There was no insurance, no hedge. It was literally life or death. As a kid, playing this part of the game always struck me as funny. The Columbia River I knew had no rapids, no falls, and no obstacles that would imperil a trip. With the flooding of Celilo Falls and the construction of the river’s dams, the face of the area had changed, and the wild river was tamed. In the aftermath of the Lac-Mégantic explosion, cleanup and reconstruction costs were estimated at $2 billion. The train operator, Montreal, Maine & Atlantic, had $25 million of total insurance coverage. The company filed for bankruptcy within a month of the explosion, recognizing it didn’t have the wherewithal to clean up the mess caused by the explosion. Like a crash into the rocks on the Lower Columbia in The Oregon Trail, a mistake made here had life-or-death consequences. However, unlike The Oregon Trail, the consequences still required cleanup efforts, an expensive burden to be covered by the public taxpayer. So what is an oil train, and why does it explode? An oil train is like any other other train in the sense that it’s operated by a large freight train company, such as BNSF Railroads, and it has over a mile of railcars full of freight. In this case the freight is oil, 700 barrels per railcar, 100 railcars per train. That 70,000 barrels of oil is more oil than would be needed to fill four olympic sized swimming pools, which is one major difference between an oil train and other trains. When a freight train derails, the damage is confined to the debris that falls from the railcars and is localized around the accident. But when an oil train derails, it often combusts; like a moving bomb, derailed oil trains have a tendency to explode. And oil train derailments happen more frequently than you would expect. The most notable explosion to date was the Lac-Mégantic, Quebec disaster, but there have been more. In 2014, an oil train derailed in Lynchburg, Virginia, and spilled 30,000 gallons of crude oil into the James River. The same operator, CSX, saw another train derail and explode in southern West Virginia in February, 2015, causing the evacuation of 1,000 nearby residents and poisoning their drinking water. In May 2015 the same thing happened in rural North Dakota. The 10 cars that derailed and exploded forced the evacuation of nearby Heimdal. A 2013 oil train explosion in Aliceville, Alabama, spilled 630,000 gallons of oil. 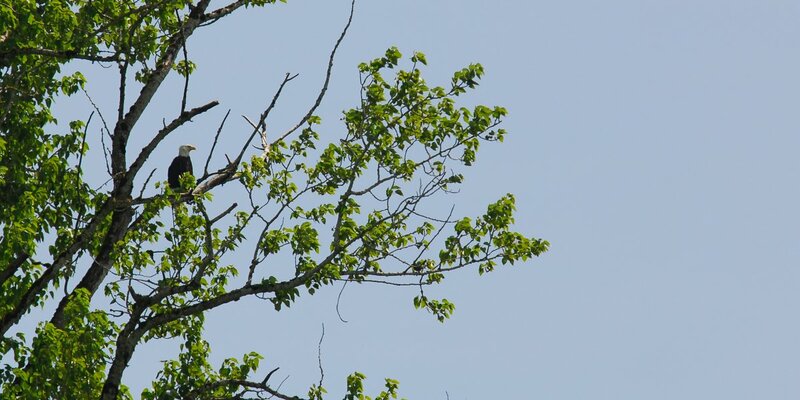 A bald eagle perches at Ridgefield National Wildlife Refuge. Photo by Tyson Gillard. Two beautiful, important wildlife refuges sit on an oil train's path through the Columbia River Gorge. Just downriver from Beacon Rock sits Steigerwald Lake National Wildlife Refuge, and across the river from Sauvie Island in Portland is Ridgefield National Wildlife Refuge. Both provide critical nesting habitat for raptors, migrating waterfowl, beaver, deer, and other wildlife that once enjoyed free range throughout the Columbia River Gorge and Willamette Valley. Exploring these areas, binoculars in hand, provides a visible reminder of the important roles healthy wildlife populations have played in the life of the Columbia River Gorge, and how fragile these populations are. Any spill upstream from or near these areas would have an unfathomable effect on the habitat and shelter these refuges offer. From the end of the Columbia River Gorge Scenic Area, trains continue through Vancouver, Washington. The tracks pass just outside of Fort Vancouver, the trading post erected in 1824 as the first permanent establishment in Oregon Country. Traders from the Hudson Bay Company plied the Columbia River and its many tributaries looking for beaver pelts. The fort also served as the headquarters for settlers moving in from the east. The waterways of the Pacific Northwest were used for transportation, provided food and water, and provided an economic impetus for a growing population of European settlers. And the river had provided the same sustenance for Native Americans living along its shores for more than 10,000 years prior to the establishment of Fort Vancouver. As far as human history is concerned, Fort Vancouver is a relatively young settlement in the area, and for Native Americans it’s a reminder of an end to a much older way of life. For all of us, it should serve as a footnote that change is constant and that we all have the ability to craft it for better or for worse. Downstream from the Ridgefield National Wildlife Refuge where the oil trains will near the end of their journey to a proposed refinery in Longview, Washington, the tracks pass the small town of Kalama. Interstate 5 lies on one side of the tracks, and a small park called the Louis Rasmussen Day Use Park is on the other. For 30 years, from 1976 until its demolition in 2006, the Trojan Nuclear Power Plant sat across the river from this small park. Years of ballot measures, environmental activism, and maintenance challenges finally forced Portland General Electric to decommission and demolish Oregon’s only nuclear power facility. Looking out from Louis Rasmussen Park, it would be hard to imagine that a controversial energy project once dominated the view. It took protests, arrests, political action, and a recognition that certain environmental risks outweighed the economic benefits. Soon, a long line of black rail cars may incite the same activist will. It has already started with the recent trial of the Delta 5, who blocked an oil train outside of Everett, Washington. Cities, towns, and environmental groups along the Columbia River are making their opposition to the proposed export terminals and the increase in oil trains heard. As lovers of the Columbia River Gorge, we can make our voices heard as well. State leaders from Washington and Oregon have an opportunity to block the development of export facilities that would be needed to handle the increase in oil delivered by rail. We can let it be known that we don't want to put our backyard wilds at risk for a fossil-fuel catastrophe. Too many of us rely on the river for our livelihoods and active pursuits. Visit Stand Up to Oil for ways you can take action. And follow the efforts of Sightline Institute to gather and share information regarding oil train risks, oil terminal projects, and other energy issues impacting the Pacific Northwest. Specific work is captured in their Thin Green Line reporting. This article was made possible thanks to the research assistance of Sightline Institute, and special thanks go to to Sightline’s Serena Larkin for her input.